Some trends seem artificial, irrelevant or a comeback that feels forced. Real design trends originate from a shared sentiment, outlook, lifestyle or response to an existing situation. In order to become a natural trend instead of only a commercial strategy, these feelings need to be a reality for many. The selection below represents a common expression. Whether its style is shared by ethnic, artsy, folksy or geometric trends, the strong palette, character and repetition in these pieces create statements that are hard to pass by. Supported by symmetry or the deliberate lack of it, these outfit tellers represent an attitude. The reason for its boldness and patterns? To compensate for uncertainty in an ever-changing world. 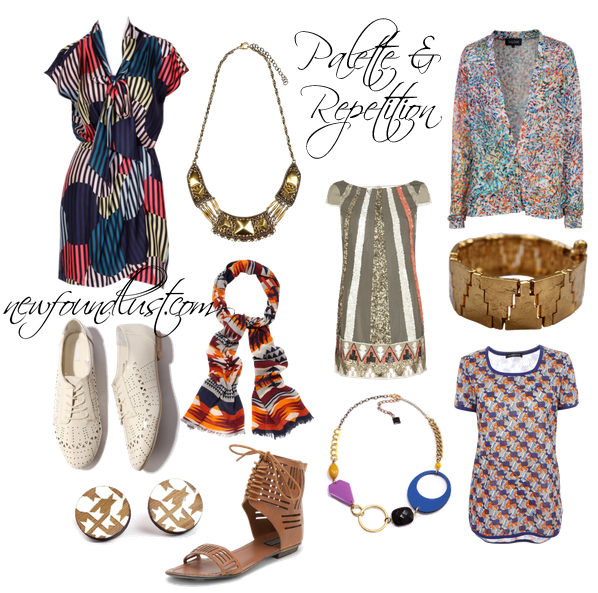 From left to right: Multi colored geometric silk dress by Diane von Furstenberg; Golden aztec inspired necklace by Pamela Love for Topshop; Silk print cardigan by Saloni; Lasercut oxford by Cooperative, Urban Outfitters; Ethnic geometric print scarf by Kookai; Aztec dazzle dress by All Saints; Vintage geometric gilt bracelet by Yves Saint Laurent; Wooden geometric earrings by Uncommonly Beautiful, Hannah Zakari; Laser cub ankle wrap sandal by Deena & Ozzy, Urban Outfitters; Wooden geometric necklace II by Uncommonly Beautiful, Hannah Zakari; Geometric patterened t-shirt by Balenciaga.